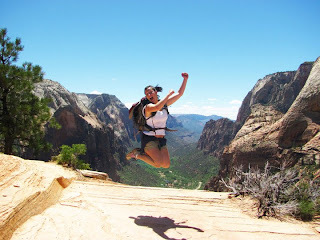 Angel’s Landing in Zion National park is one of the best hikes that I've ever conquered and easily one of the best in United States. From the canyon floor, the hike looks nearly impossible. Under a cloudless sky in the scorching summer heat, the endless switchbacks can sometimes feel impossible too. The reward when you reach the top is well worth the effort. 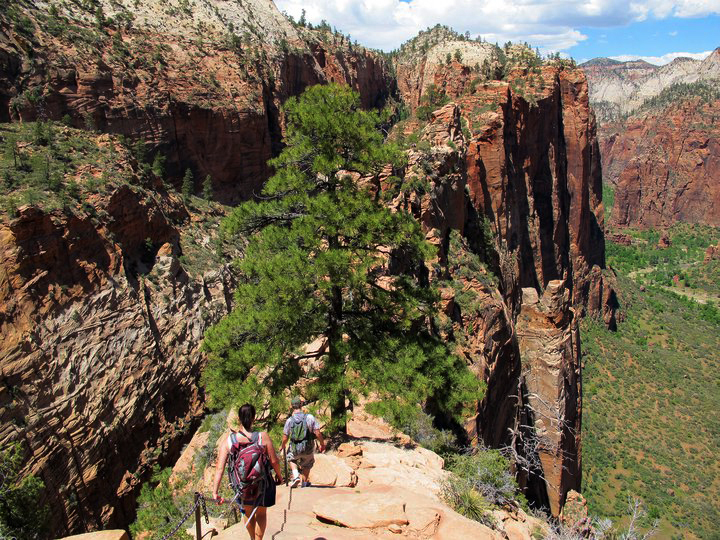 Angel's Landing is the Sistine Chapel of hiking. In his wildest dreams, Michelangelo could never have painted anything as beautiful as the birds-eye view of Zion National Park from the top of Angel's Landing. The hike starts at the Grotto Trailhead in the main section of Zion National Park. You cross the foot bridge over the Virgin River to the west side of the canyon and head up the daunting set of switchbacks affectionately known as “Walter’s Wiggles”. If you’re in decent shape, you’ll inevitably pass the multitudes of red-faced, overweight tourists slogging up the hill. The further up you get, the more the crowd thins out. By the time you reach Refrigerator Canyon, your legs will definitely be pumping some blood and most people take a short water break in the shade. There are a few small wind caves that you can explore on this part of the hike. You begin a more even ascent towards an area known as Scout’s Lookout. I heard a tour guide say the area directly below the cliff is sometimes called “Scout’s Landing” by the locals in honor of all the Boyscouts that have accidentally fallen over the ledge. A close friend of mine lost an uncle in this exact spot. The views from Scout’s Lookout are amazing, but they get better. From here, you start a harrowing climb up the chains on a path that narrows to just 2 feet across on a cliff with vertical decent of several thousand feet. It can be a bit terrifying to share the path with people crossing in the opposite direction. A lot of people see the chains and can’t work up the courage to climb more than a few feet before they turn around and head back down. 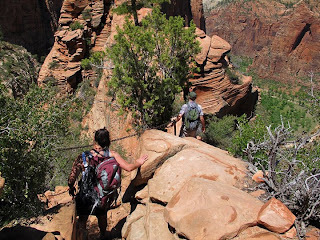 This part of the hike is obviously not for anyone with acrophobia. 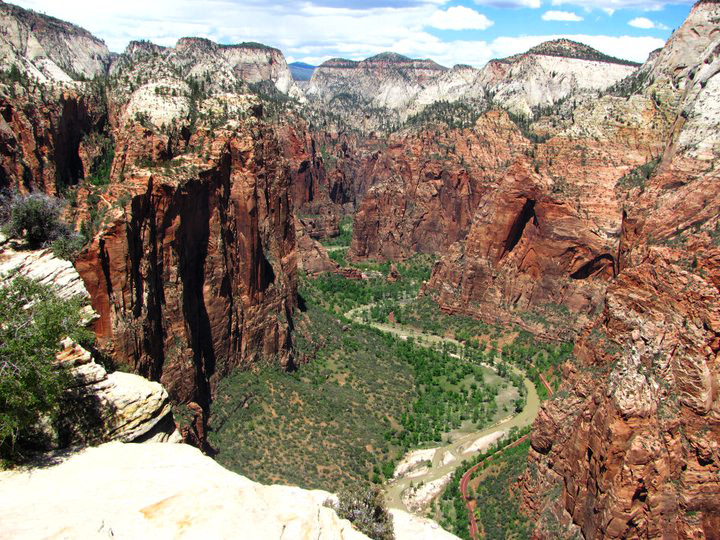 The panoramic view from the top of Angel’s landing is worth twenty minutes on the chains. I won’t even bother trying to describe the scenery, other than to say you are several thousand feet above the Virgin River, looking down at the most awe-inspiring site you will probably ever see in your entire life. Keep an eye on your pack at the top. The chipmunks are crafty little devils and they will make a mess of your food if you leave anything unattended. I wonder what they eat in the winter when the tourists aren't there to feed them? Angel’s Landing is listed at 2.4 miles each way from the Grotto Trail-head, but it feels substantially more difficult because of the elevation gain and the constant exposure to the sun. It takes anywhere between 3-6 hours to complete this hike based on your pace and level of fitness. I would rate this trail as strenuous and completely unsafe for children. In the summer heat, this would be an extremely strenuous hike. In fact, I think you could make a strong argument that kids under 12 probably shouldn't be allowed on this trail at all. I saw a set of parents on this hike towing along a young child wearing Crocs. Those two geniuses definitely won’t be winning a “parent of the year” award anytime soon. Admission to Zion National Park is 25$ and is valid for 7 days. This pass is also valid at Kolob Canyon. If you plan on visiting multiple national parks this year, you should definitely order an annual National Park Pass for 80$. 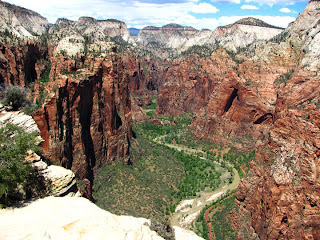 There are several campgrounds in Zion National Park. I highly recommend a reservation because they definitely fill up. Don't forget to bring your bike. Zion is a great place to ride.